Teen lifesavers save two lives. While the water seemed shallow, very soon the young boy was sucked from the shore out of his depth and in difficulty. His Dad went to his rescue. 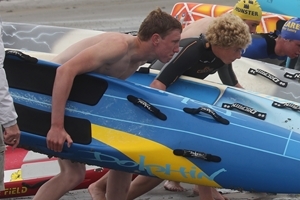 While the mother watched and tried to raise the alarm, two young surfers who were just coming out of the water, Bernard Cahill (17) and Donough Cronin (17) spotted the situation and immediately went to the rescue. They quickly powered through the water and very soon Bernard had the young boy plucked from the water and safely on his board. Having returned to the shore with the young boy, Bernard reassured him and re-entered the water to help Donough rescue the Dad. Lifeguards, Niall O’Farrell and Wayne Timmons had rushed from the Lifeguard Station and were now part of the rescue. Without any fuss and with complete confidence, they formed and reformed a triangle with their surf boards and eventually they succeeded under difficult conditions to rescue the father and safely brought him to shore.